The perfect wedding begins with an exceptional location. 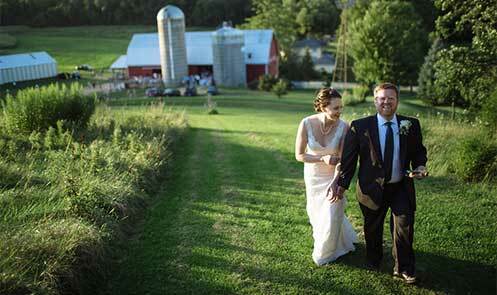 Our Elegant Barn Wedding Venue at Justin Trails Resort is located near Sparta in the Driftless Region of Southwest Wisconsin. The rustic resort ambiance, where natural organic surroundings meet romance, is the perfect setting for rehearsal dinners, outdoor wedding ceremonies as well as dinners and dances inside our Elegant Barn. Our stunning 200-acre property is nestled in a peaceful, quiet valley with a beautifully landscaped property. Your ceremony is sure to be a photographer’s dream! We host only one wedding at a time to ensure you have an exclusive, intimate experience. Whether you’re celebrating a wedding, elopement or LGBT union, join us for your special day arriving as a guest and leaving as a friend. We will help you create lasting memories and a haven to return to year after year for your Anniversary. Say “I do” with a destination wedding and create an experience that is uniquely yours by spending a mini-vacation with friends and family. 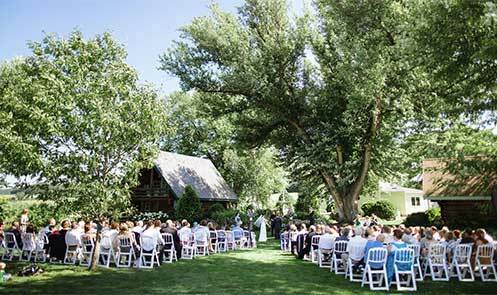 Choose from a dozen outdoor ceremony sites around our property. 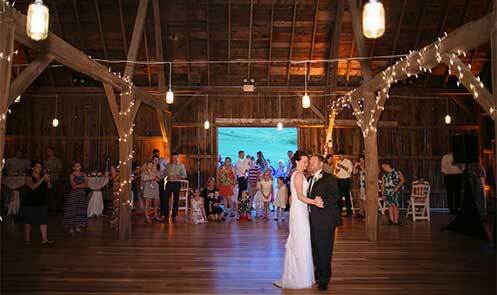 In the event of rain, your ceremony can be held inside our Elegant Barn. Our resort is privately owned and nestled in a peaceful, quiet valley with three acres of manicured lawns and beautifully landscaped English gardens. We landscaped with a photographer’s eye in mind to create a romantic setting for intimate ceremonies for two, outdoor wedding ceremonies or larger tented celebrations. Couples may choose from a diverse selection of backdrops for their ceremony including lush meadows, woodland and majestic hills up to a quarter of a mile away from the main facility. We are happy to help you with planning transport of guests. Garden wedding ceremonies are set within walking distance of restroom facilities in our Elegant Barn and lodging. Take over this extraordinary space and make it your own. The best part of choosing Justin Trails Resort for your wedding is the time you spend with friends, family and pets. We offer romantic cabins, cottages and farmhouse suites for up to 24 guests to stay on site at our Wisconsin bed and breakfast. We also have several campsites for the outdoor enthusiasts. Guests will enjoy plenty of room to play lawn games and enjoy the outdoors, walk on our trails, enjoy a bonfire, stargaze or just relax and soak it all in. 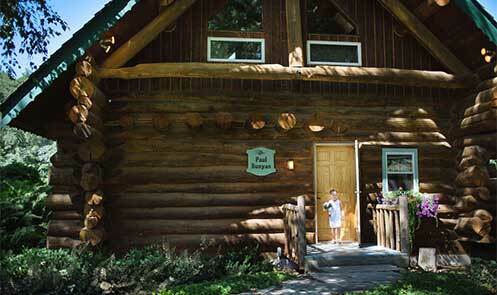 We recommend couples choose our romantic Little House on The Prairie log cabin for their weddingmoon. We host one wedding at a time to ensure an exclusive, intimate experience. We allow your choice of tables and chairs rental, and you can arrange them any way you like. We can recommend vendors or you may choose your own. Decorate to suit your style! Your weekend rental includes time to decorate on Thursday, rehearsal on Friday, ceremony and reception on Saturday and time to remove decorations on Sunday. Enjoy a rural farming theme, including a variety of fun backdrops for photographs. Use your choice of a licensed caterer without an up charge. Beer and wine for your event must be purchased through Justin Trails Resort. Our professionally engineered barn includes adequate ventilation and spacious bathrooms with handicap access to accommodate your family and friends with special needs. Justin Trails Resort provides outdoor recreation on site for all ages, including two disc golf courses, playground area, bonfire circle, and groomed trails for hiking. We have a playground and large grassy areas for children to play away from busy streets. Our llamas love eating treats right out of your hand! There is plenty of room to play lawn games like croquet, volleyball and softball. Your friends, family and pets will be able to enjoy the outdoors, walk on our trails, hike up to our Rock, play disc golf, enjoy a bonfire, stargaze or just relax and soak it all in. Tents provide versatility to spread out for wedding celebrations of 200+ guests. Serve dinner in your tent then head over to our Elegant Barn for social time and dancing. Our spacious lawn and perennial flower gardens include plenty of room for a large 40′ x 140′ tent. Ample parking is located within easy walking distance. Donna Justin is a certified wedding venue owner and will be available all weekend to assist you. We also provide security personnel through the entire evening. The property includes free, lighted parking and handicap parking for your guests. Our barn has been reviewed by an engineering firm and Department of Safety and Professional Services. We have plenty of electrical outlets and circuits for all your needs, as well as a heat detection system with two phone lines to call the fire department in case of an emergency. We require that you book resort lodging Friday and Saturday night for total privacy, intimacy and plenty of room to spread out. Onsite lodging is available for 24 guests. Rustic tent camping is also available for up to 30. Enjoy Saturday and Sunday morning together with family, friends and a delicious breakfast served in The Lodge between 7:30 am and 10:00 am. We offer a flexible payment schedule and provide liability insurance for your event. 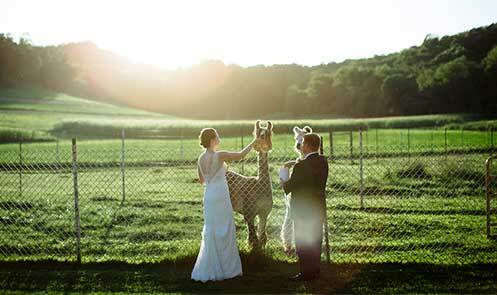 See our frequently asked questions for more details on our Wisconsin wedding venue. You must get the marriage license in the county you reside and then you can be married anywhere in the state. (If the Bride and Groom are from separate counties, you may go to either county.) Non-residents must get their license in the county that the marriage takes place. (Justin Trails Resort is in Monroe County.) Contact Monroe County Clerk’s Office 608-269-8705 202 South K St., Sparta, WI. 54656. No appointment necessary. Both parties need to be present. Bring with you: Social Security number, photo id, certified birth certificate with stamp from register of deeds where you were born (not the hospital copy), if a prior marriage then you need a document stamped from court of divorce or annulment or death certificate. Our charming wedding venue provides a picture-perfect backdrop throughout the changing seasons. Nature’s beauty provides lovely scenery and a relaxed vibe giving you the freedom to create a cozy DIY country celebration. Reach out to Certified Wedding Venue Owner Donna Justin at 608-855-0282 or donna@justintrails.com to book your wedding date today! Or complete our online Request for More Information form. Back to nature we go. Snuggled within stunning valleys on 200 acres, you’ll fall in love with the beautiful, uninterrupted views of rolling green hills and woodlands as far as the eye can see. Depending on your chosen wedding style and number of guests, three unique spaces are available for your wedding ceremony including fragrant Perennial Gardens, Nature-Lovers Havens and our majestic Elegant Barn. Nestled in the heart of the Resort, our fragrant perennial gardens offer a dreamy, romantic setting for wedding ceremonies. Guests enter the gardens from enchanting, flower lined, brick walkways. There is an abundance of color and fragrance throughout the spring, summer and autumn. This venue is truly an oasis of calm which stimulates the senses and is the perfect setting for your nuptials. Your ceremony is one-of-a-kind and we offer many options. Choose a site that fits your style…. A beautiful 1919 barn converted to a modern event venue, offering endless options for customization or a Plan B if rain is in the forecast. The barn, with its post and beam construction and 3,000 square foot wood floor, provides an immediate ‘wow’ factor. This eco-friendly venue is complete with a sustainable floor made from 6 hardwoods, a portable wood bar and water conserving restrooms with showers. 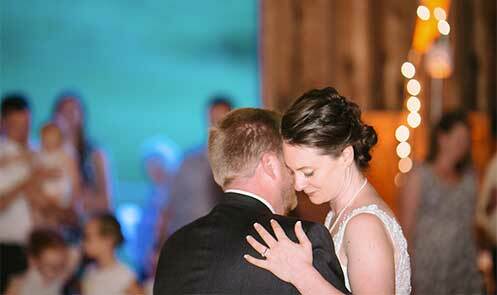 Some couples choose to have their marriage blessed inside because they love the white oak beams while some opt for a ceremony outside the big red doors on the sunny side of the barn. This rustic wedding venue provides a picture-perfect backdrop throughout the changing seasons. Nature’s beauty provides lovely scenery and a relaxed vibe giving you the freedom to create a cozy DIY country celebration. Contact Certified Wedding Venue Owner Donna Justin at 608-855-0282 or donna@justintrails.com to book your wedding date today! Or complete our online Request for More Information form. 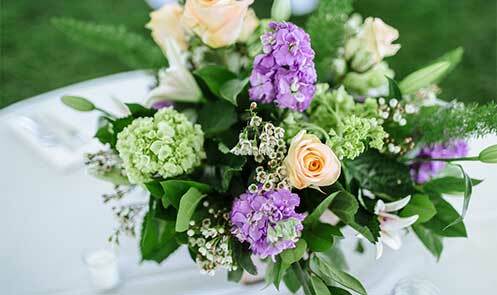 We are happy to provide you recommendations for appropriate caterers, florists, photographers and more! Email Donna or call 608-855-0282 to book your Wedding Bells Special! Cannot be combined with other offers or third party gift certificates. New reservations only. Reach out to Donna Justin at 608-855-0282 or donna@justintrails.com to book your wedding date today! Or complete our online Request for More Information form. How many guests does the Elegant Barn hold? On the upper level, the barn holds up to 200 guests seated at tables and chairs. After dinner, tables and chairs may be removed to open up an area to dance. Bathrooms are heated and cooled. Yes, the entire second floor on the upper level can be used as a dance floor. After dinner, tables and chairs may be removed to open up an area to dance. May I move things around and decorate as I choose? We allow the flexibility so you can make it “your own!” Our Elegant Barn is an open space with few decorations. We do have Mason jar lights. There are many electrical outlets around the building to meet any electrical needs you may have. You may decorate with floral tape, wire or fishing line but please no staples or nails. When may we enter the barn to decorate? We are happy to make arrangements with you. Generally we have our barn available on Thursday for your Saturday wedding. Sunday weddings may enter the barn at 8:00 A.M. on Sunday. How late may we stay in the barn? The Elegant Barn closes at 12:00 am every day. We understand you may want to spend time with your family and friends afterward and offer several fun options. We have a large bonfire area with plenty of wood. On clear nights the stars are phenomenal and you may enjoy stargazing or going for a night walk. We have 200 acres to spread out on or stay around the grounds in our many comfy outdoor seating areas. We also offer several camping areas for guests to congregate after the barn closes. It has been a huge hit to hang out together around a campfire. Who can cater our wedding? 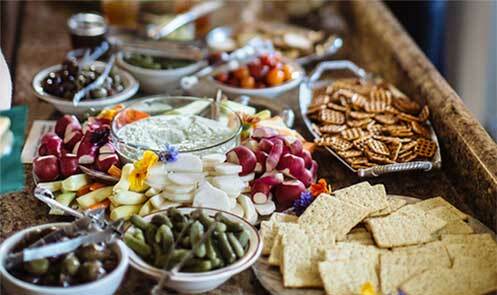 You may choose any licensed caterer you would like. We have a list of caterers who have worked with us before and are familiar with Justin Trails Resort. We do not provide tables and chairs. Tables and chairs may be rented from Nelson’s Rental Center in Viroqua or Vintage Valley La Crosse for gorgeous cherry and American walnut farm tables and benches or another rental outlet of your choice. Do you provide table linens and table service (plates, glasses and silverware)? We do not provide table linens or table service. Justin Trails Resort owns a license to sell beer and wine. If you choose to serve beer and/or wine at your wedding, we require that you purchase beer, wine and champagne from us. Hard alcohol such as brandy, vodka, whiskey, etc. are prohibited from being served at our events. Do you charge a corking fee? We do not charge a corking fee because you are not bringing in bottles of wine. Are there additional charges for the wait staff? Wait staff will be provided by your caterer. We do not charge an additional fee. What are the clean-up responsibilities for the Elegant Barn? Justin Trails Resort staff will provide a clean venue when you arrive. We service the restrooms throughout the evening and remove garbage during your event. Your caterer is required to remove food garbage. Is there room for the bridal party to prepare for the big entrance? Yes, we have large, spacious bathrooms on both levels in the Elegant Barn where you can stage your entrance. Our large Paul Bunyan log cabin and suites in our 1920 Foursquare Farmhouse are also areas brides may choose for preparations. Do you have enough bathrooms? Yes, there are large, spacious bathrooms on both levels of the barn. The first level bathrooms include showers. All bathrooms are heated and cooled and were engineered to exceed Wisconsin State code. The women’s bathroom on the second level has 3 toilets and the men’s room has one toilet and two urinals. Yes. We offer areas for children to play including a playhouse, interesting gardens and open grassy, hilly areas that children love to roll down. Little ones enjoy our quiet, peaceful valley filled with birds, butterflies, 2 llamas, a very friendly Siberian husky and neat things to see and explore. Our space is comfortable, relaxed and safe for children to play. Is the building ADA (Americans with Disabilities Act) compliant? Yes, both levels are easily accessed by wheelchair. Is there enough parking for my guests and is it complimentary? Yes, there is enough lighted parking and parking is complimentary. Is there heated outdoor space for our smoker friends? There are designated areas near the barn with benches. We do not have a sound system. We will only hold one event per day. For Saturday weddings: As part of the Justin Trails Resort wedding experience, we require that you book the whole resort Friday and Saturday for your family and friends. You’ll enjoy privacy, intimacy and plenty of room to spread out. Onsite lodging is available for 24 people. Camping is also available. Enjoy your morning together with a delicious breakfast served in The Lodge between 7:30 and 10:00 on Saturday and Sunday morning for a Saturday wedding. Weekday and Sunday weddings: Book half of the resort – we believe you’ll be happy with your decision, we’ve noticed family and friends who stay at Justin Trails Resort enjoy this special time together. $1,000 to hold the barn space and the balance split evenly between three additional payments that we agree to the month. With your deposit, we will reserve all rooms in your name. Once we reserve your rooms online, it is not possible for your guests to make their room reservations online. Therefore, two months before your wedding, each person who is paying for a room needs to call 608-855-0282 to reserve their room or rooms. Lodging fees are paid on the day of arrival. Couples choosing to marry at Justin Trails Resort need to be committed to their wedding plans. As a result, cancellations only need to be handled on a case by case basis.